You know that my favorite room is the library. I see a lot of activity from the large picture window. I love the view of my flower garden, but those energetic squirrels are always a joy to watch. They perform the usual: climbing trees, quickly running from one safe place to another place, hanging upside down from the bird feeder while enjoying the bird seed meant for the sparrows and scrub jays. The brown tree squirrels must enjoy our front yard because they have very little freedom in the back yard. Dear Daisy Flower, our yellow lab, entertains herself by tracking down squirrels. I'm sorry to say, a few slow runners have not made it to safety in time. Therefore, the front yard is the squirrel’s safest abode. The squirrels use their little paws to remove the outer covering from rose hips or nuts so they can eat what's inside. Watching squirrels flip their tails as they communicate with each other is fascinating. Flipping their tails is similar to dogs barking, but do you know what they are saying? They chase each other around the yard and up the trees to their hiding places. They are constantly eating food, burying it, and then looking for what they buried yesterday. This morning my eyes followed a curious squirrel. A smaller, probably younger squirrel stopped in the middle of the dew-covered lawn, grabbed his tail, pulled it around in front of him and rubbed it for a long time. At first I thought he was drying his tail, but then he vigorously rubbed his chest. I decided he must have fleas. Never before have I seen squirrels touch their tails. Their tails are usually flying gracefully behind them as they run to their next adventure. Their next adventure could be mine if I am in the library at the right moment. Does this sound familiar: “We will never do that again”? I have said “never again” to painting the house, never again to refinishing the hard wood floors. This week we went through another “never again” experience. We have over fifty gold fish swimming with our beautiful koi and you know what they do in the water. Let me tell you what happens when the pond filter isn't working properly. Sewer smell, sludge, and algae happens. This month the fish appeared to be in a stupor because they wouldn't leave the bottom of the pond. We could barely see them in the thick, dark water. That's a bad sign. We knew their hours were numbered so we had to do something fast. Drain the pond and add fresh water. Doesn't that sound easy? It took two hours to catch the fish. We stored them in a huge plastic fish tub which was so graciously loaned to us by the Eugene business, Downs By The Pond. My husband Craig used our sump pump to drain the pond. The pump eventually lost suction because of the shallow water, so the shop vac finished the job. With the water removed, we could see the thick brown slim and green algae on the bottom of the pond, the walls, in the potted plants. It covered everything! This was a job for a pressure washer. So I was putting water in the pond with the pressure washing while Craig was pumping it out of the pond. The pond is four and one-half feet deep and about eighteen by twenty feet wide. Most of the plants needed more pea gravel and some had outgrown their pots and needed to be re-potted. So now was the time for that job as well. All this was done between rain and a hail storm. As usual here in the valley, there was a little sunshine in between the storms. We finished the twelve-hour cleaning job just before dark. We covered the fish in their temporary home with a net and took our tired bodies back to the house. Refilling the pond with water, which would take about four hours, would have to wait until morning . The next day just after dawn, we returned to the garden to start filling the pond with fresh water. Guess what we saw on the ground by the plastic fish tub. Two five-pound koi fish. We think they decided to take a walk in the early morning hours. They were not flopping around or gasping for air. Their gills barely moved. Craig almost threw them in the garbage, but he decided to pray for them and put them back in the water. About fifteen minutes later, they were swimming around like nothing had happened. If you have a sick cat or dog, Craig would be glad to pray for them. Our aching backs and arms told us that cleaning the pond was one of those “never again” jobs. At least not for another twenty years. Light changes our view immediately. When I rose early this morning, there was no view from the library window–just blackness. The lawn proved dark as the sky and I wondered how can I be inspired to write when I see nothing? In ten minutes, the scene changed to green grass and gray sky. The coming of daylight is so amazing and inspiring. How quickly the scene can change. Imaging watching the creation of the first day when God said, “Let there be light. . .” and seeing it dramatically appear. If you and I rise early enough, we can watch light happen all over again. The word, quickly, reminds me of the last promise in the Bible: Jesus will come quickly. My goodness! Who says darkness can't be inspiring? I'm so pleased you came for a visit, but I'm definitely not happy that two large hawks arrived for a visit today. When the boys were young, we enjoyed counting the hawks along the I-5 freeway as they perched in a tree or on a fence post waiting for a field mouse to leave its hiding place. There is no welcome sign here for hawks because they are not spying for mice, but fish. Today, one landed on the top branch of a cedar tree and the other one made a dive into the pond. The ugly fowl abruptly left with gold in its clutches. They can steal all the gold fish they want, but they better not even dream about the eighteen-inch koi or there will be “Trouble in River City”. Your tip for the day: Eat a chocolate bar before each meal. It will take the edge off your appetite and you will eat less. Today began cold and damp; time for Red Rose tea. Canada introduced us to this brand several years ago while on vacation. This one became one of my favorites because no matter how long it steeps, the tea doesn't become bitter. I declare Red Rose the ultimate summertime sun tea. Look closely and you can see large dew drops lined up on the bare branches of the red horse chestnut tree outside my library window. If you can benefit from a quiet time this morning, come and watch them with me. The large drops are all in a row like a string of precious white pearls. You better come soon because when a gentle breeze begins, the drops fall one by one, never to be seen again. He is running so fast his little stick legs are a blur! Watching this lone red robin reminds me of an old roadrunner cartoon. In my yard the robins usually hop, hop and pause as they look and listen for worms. But this little guy zips licketysplit across the yard. He must be going somewhere important. Do you have something important on your list today? I'm having lunch with one of my best friends. I recommend the restaurant upstairs at Valley River Center. I declare their carrot bread moist and not too sweet. Just perfect. This morning before dawn, our east security light illuminated the bedroom. I was already thinking of getting out of bed, so I quickly grabbed my glasses and peered out the window to see what creature was trespassing through our yard. Hop, hop, hop, then it disappeared quickly beyond the floodlight. One little black and white bunny returned this morning. Who would dare complain of being awakened by a bunny? I wish he or she would visit in the daytime so we could really enjoy the furry fellow. My husband and I first discovered our bunny visitors this year in February. Gazing through the library window right now, I see two colors: black and midnight blue. Midnight is long past and the sun will soon rise. Thirty minutes later the color black has yielded to the green of the lawn, and a new day has dawned. 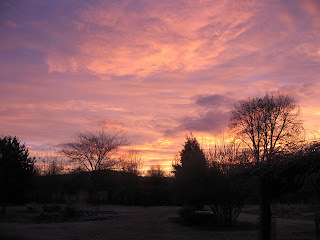 “This is the day the Lord has made; let's be glad” in whatever our circumstances. My floral tea cup is empty and I have been reading my favorite book for an hour. Now the bright sun is making everything outside glow. I'm sure you have seen days like this. The green grass appears exceptionally bright and the yellow-tipped arborvitae shines. We need to enjoy the brightness while we can because, probably in two minutes, the sun will disappear behind a cloud as it has done all week. Speaking of the sun, from my library window I can see the sun I painted. 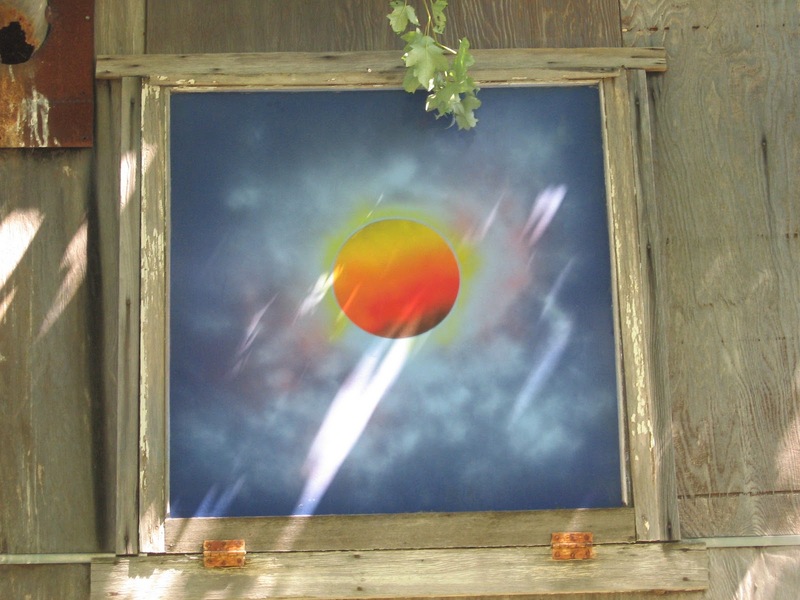 I spray-painted a colorful sun on the window of the neighbor's barn wall that borders my garden. The high window was the perfect location for my art work. Creating this picture last year was a delight and so easy to accomplish. A helpful on-line video demonstrated how to create this feat. Talent is not necessary in this style of painting. Rain or shine, I can always see the bright sun outside. I named the picture, "In the Beginning, God. . . ."
Enjoy your view of the universe!